Vesta Control Panel is deservedly popular with our users. 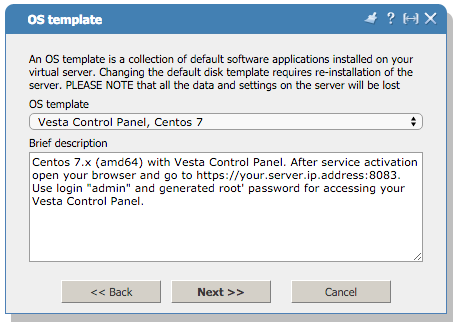 We prepare a special template for our SSD VDS – Centos 7 with Vesta Control Panel preinstalled! Vesta Control Panel has all features for managing server – even without ssh access user can manage websites, email, dns and so on. As you probably know, the installation does not cause any problems – just upload to the server installation script, run it, and after a few minutes Vesta will be installed. Now, this step can be done automatically – when ordering any SSD VDS can select specially crafted Centos 7 preloaded with Vesta. Centos 7 – stable Linux distro, based on rock-solid RedHat Enterprise Linux distributive. Centos 7 a new version with long-term support. PHP 5.4.x onboard (5.4.45+), you can also upgrade it to newer version, up to PHP7. How to order SSD VDS with Vesta Control Panel? It’s easy and can be done in few steps. Select your package, then you will be redirected to customer’s portal ITLDC, specify hostname and select “Vesta Control Panel, Centos 7” operating system template. All our services has instant activation within 10-15 minutes. After service activation you will receive email with IP address and root password. Open your webbrowser with Vesta login prompt and enter login name ‘admin’ and root’ password in appropriate fields. Your server with Vesta ready to use!